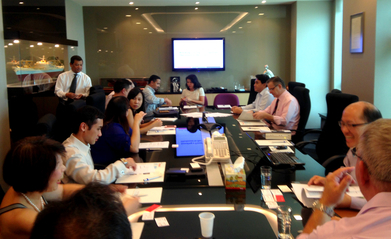 JTJB’s Senior Partner, Danny Chua, delivered a talk on this topic on 16 July 2014. The seminar topic sparked the interest of many, with the seats being oversubscribed. The talk covered areas such as the requirements of full and frank disclosure and consequences of a failure to make such disclosure. 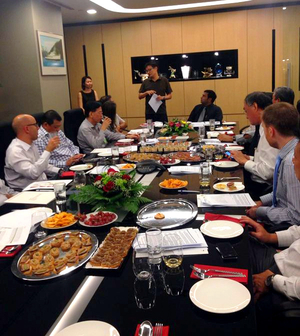 Amongst the attendees were representatives from Singapore Technologies Marine and Wartsila Singapore. Attendees found the seminar to be very informative and useful with the post seminar networking session providing a platform for them to exchange notes and pointers gained from the seminar. Our 2nd Wine Tasting for 2014 was held on 4th July at our office. Wines from the Burgundy region in France were the focus for the evening. The wines were paired with a selection of canapés carefully chosen by our wine professional. The exclusive, small group networking event provided a memorable experience for all who attended. 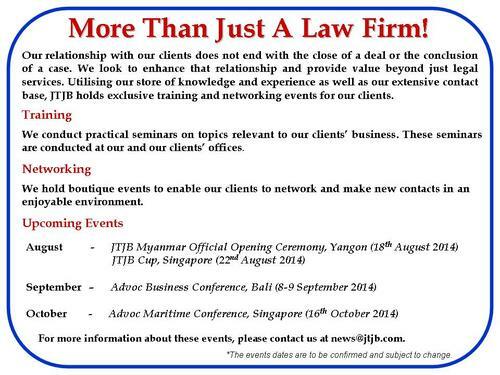 JTJB Myanmar Co Ltd, formed in August 2013, will be holding its official opening ceremony on 18th August 2014 at the Chatrium Hotel, Yangon. Our Myanmar office is headed by Ms Su Su Myat. She has extensive experience in dealing with inward investment issues and approvals, and is an accomplished corporate lawyer. Loretta Lim, from our Singapore office is also currently based in Yangon. Invited guests include dignitaries from the Myanmar government and members of the business community. Should you wish to attend the opening ceremony, please email us at news@jtjb.com for an official invitation. JTJB is a boutique full service Singapore law firm. For more information about our Firm and our services, please contact us at info@jtjb.com.